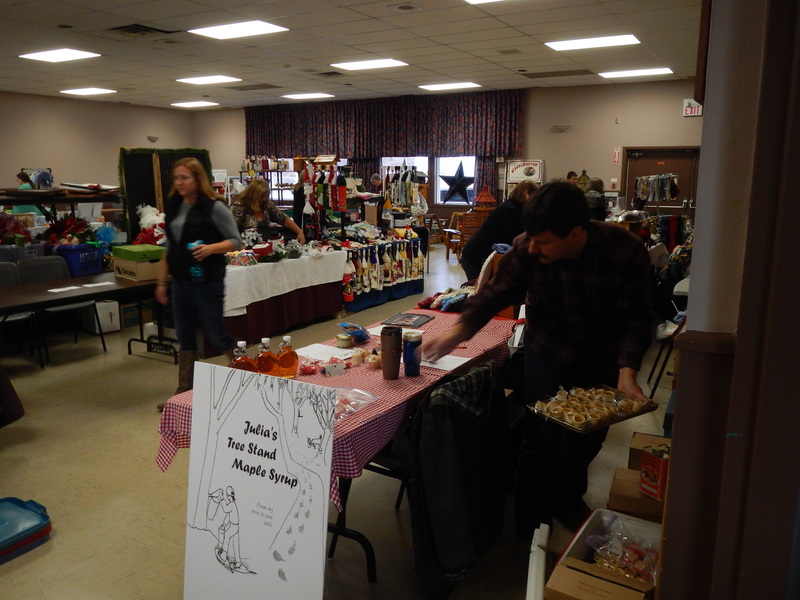 Here we are getting unpacked for selling maple syrup and maple products at the Kinburn Christmas Craft sale. This past weekend marked my second market experience, this one where I grew up in Kinburn, Ontario. And what a fun experience it was, and successful too! I sold maple syrup and other value-added products like maple fudge, maple butter and maple cones. Held in the Kinburn Community Center the craft sale brought back memories of my childhood and my Dad teaching me how to make maple syrup, going on school field trips to sugar bushes, and joining a maple syrup 4h group and much more. And the Kinburn Community Center holds some special memories for me too: I can remember going to family dances as a child in the very room I sold maple syrup in, taking tai kwon do classes, and so much more. And I reconnected with a number of people I had not seen in years! I felt like I was at the right place at the right time this weekend. Thank-you to the organizers for ‘fitting me in’!